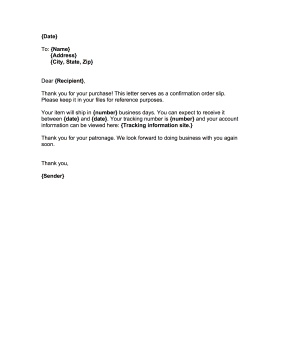 Online companies and delivery services can use this printable shipment procedure letter as a confirmation notice that includes delivery information and dates. Thank you for your purchase! This letter serves as a confirmation order slip. Please keep it in your files for reference purposes. Thank you for your patronage. We look forward to doing business with you again soon.